While the Cornish were the acknowledged experts in deep mining for both tin and copper, they had been forced to send their copper ores to South Wales, where abundant coal seams provided the necessary fuel for the smelters. It was the Welsh therefore who developed their tightly held expertise in smelting from the 1580s onwards. The Cornish tried to circumvent the high costs charged by the Welsh and gain the expertise for themselves. John Penrose Christoe was a product of this long-standing rivalry between the Cornish and the Welsh. John Penrose Christoe was born in Swansea, South Wales on 26 April 1830. His grandparents, James Christoe (b.1766, Redruth, Cornwall) and Sarah (nee Penrose) married at Redruth on 17 December 1791. Their son, William Christoe, was born there in 1792. William became an assay master at Swansea, South Wales, and married Eliza (nee Madge) there on 16 June 1819. John Penrose Christoe was their third son, born before the family returned to Truro in Cornwall by 1832. He came to Australia to work at the Kapunda Copper Mines in South Australia in about 1850. He married Dorothy Blood at Kapunda in 1852, and then appears to have returned to Wales until 1858. In 1859 he travelled to New South Wales and became mining and smelting manager at the Carangara Copper Mine at Byng, the Cornish Settlement. Christoe advised Morehead on the prospects of the Good Hope Mine, near Yass, in 1859 and also assisted him in evaluating the resources at Cadia. By 1861 Christoe was employed at Cadia as mine manager and smelterman. Morehead had praised the abilities of Christoe to the company directors and urged his appointment: “Mr. Christoe can proceed to erect furnaces, and to carry on smelting, with the confidence that is engendered by his having already done all this, with perfect success, in the neighbourhood, his local expertise, therefore, will enable him to proceed with an economy and efficiency that no other metallurgist could bring to bear”. Having already constructed a set of reverberatory furnaces for the Carangara Mining Company in 1859, Christoe was well placed to do the same at Cadia in 1861-1862. With Christoe’s advice, Robert Morehead was confident enough to negotiate terms with the four main property investors at Cadia, namely John Savery Rodd, Saul Samuel, Randolph John Want, and Thomas Icely. On 15 July 1861 the Scottish Australian Mining Company took out a 21 year lease for mining purposes on three portions of land at Cadia. The Scottish-Australian Mining Company commenced operations at the Oaky Creek Copper Mine at East Cadia (also known as the Cadiangullong Copper Mine) almost immediately. Captain John Penrose Christoe was placed in charge of the work, assisted by Captain Johns, who had been a member of the Canoblas Mining Company at Little Cadia. Although a track or road is shown on Baker’s Atlas for the County of Bathurst, running from Bathurst as far as Cadiangullong Creek, through William Lawson’s land at Errowanbang, nonetheless both Robert Morehead and the investors knew that they needed better communications if the mine was to succeed. By May 1863, the road to the mines had been surveyed and marked out by surveyor Edward Combes, though the mining company itself had expended funding on road making by December 1861. By November 1861, 200 tons of highly productive ore has been raised at East Cadia (Cadiangullong Mine). On 12 December 1861, the Western Examiner newspaper of Orange noted that a smelter was being erected. An Inventory of plant and equipment, dated to 31 December 1861, reveals the extent of the mine, its workforce and working conditions. Copper Smelter No. 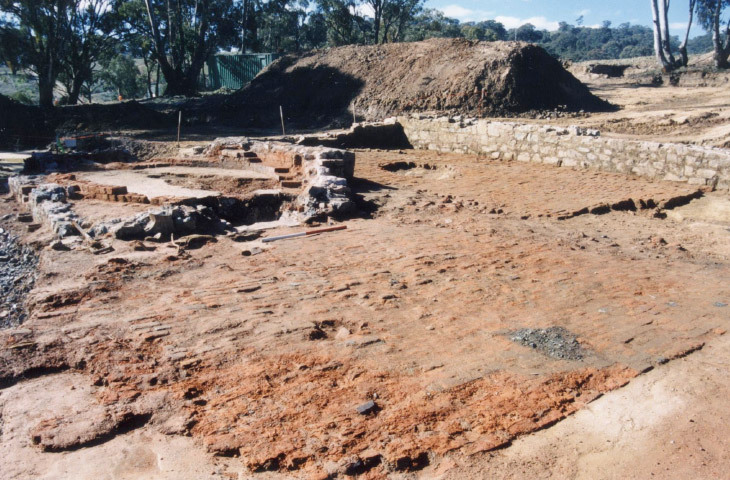 1, completed in 1861-1862, was excavated in advance of mining in 2002 (scale 1 metre) (Edward Higginbotham, 2002).